Other photos: Princess 68 Flybridge, Princess 68 flybridge à vendre, Princess 68 chez Santarelli marine, Princess 68 Flybridge, Princess yachts, Experience the exceptional, Crafted in plymouth, Photo 8, Photo 9, Photo 10, Photo 11, Photo 12, Photo 13, Photo 14, Photo 15, Photo 16, Photo 17, Photo 18, Photo 19, Photo 20, Photo 21, Photo 22, Photo 23, Photo 24, Photo 25, Photo 26, Photo 27, Photo 28, Photo 29, Photo 30, Photo 31, Photo 32, Photo 33, Photo 34, Photo 35, Photo 36, Photo 37, Photo 38, Photo 39. Baisse de prix! Lower price! Evitez les frais de courtage! Ce Princess 68 fly a toujours été en full care chez Santarelli Marine en Corse depuis son immatriculation à Ajaccio. Nous n'avons aucun intermédiaire et sommes en contact direct avec le propriétaire du bateau. Ces photos ont été prises au mois de décembre 2018 sur notre ponton privé au port d'Ajaccio puis à notre chantier à sec dès sa sortie d'eau pour hivernage. This Princess 68 Flybridge has always been under our care and lis ocated at Santarelli Marine shipyard in Ajaccio (Corsica) ! Avoid unnecessary broker fee and contact us today! Il est en ce moment hiverné sous nos hangars et disponible pour une visite. N'hésitez pas à nous contacter directement au +33 (0)6.24.92.31.55. Nous avons tout l'historique sur demande. Place de port disponible. Ses moteurs comptent 123 heures. Il possède un très grand nombre d'options et son état est irréprochable. Possibilité de reprise du leasing (LOA) en cours. SYS Yacht Sales is pleased to assist you in the purchase of this vessel. 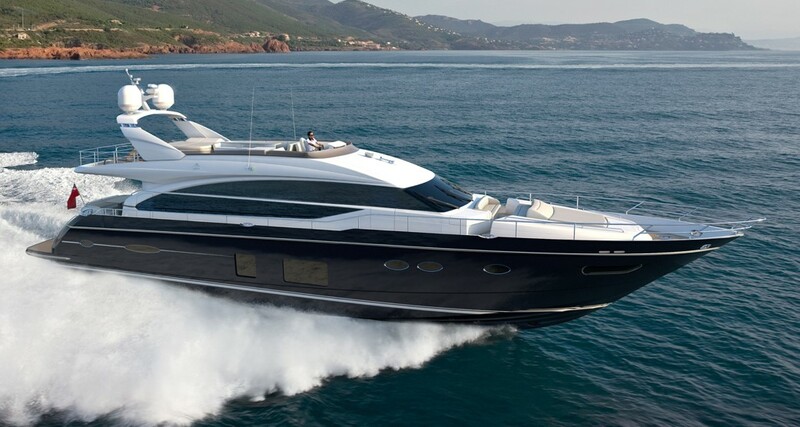 This boat is centrally listed by Santarelli Marine. Princess Yachts was founded as Marine Projects (Plymouth) LTD in 1965. Their first yacht was launched in 1974, the Princess 37 V Flybridge Motoryacht. From the largest hull to the smallest detail, every component of their yachts is meticulously designed and crafted. There will probably be some finite elements you may never notice. But combined together, they create something truly exquisite that draws attention. For all the right reasons. It’s this fastidious attention to detail and dedication to developing long-term customer relationships that has defined who Princess is since they launched the first 31-footer in 1965. A lot has changed since then. Their passion for building the most stylish, elegant yachts will always remain. Their exceptional build quality extends across our complete range of M Class superyachts, Flybridge motor yachts and V Class sports yachts. Through a culture of innovation, Princess Yachts are not only some of the most technically-advanced in the world but also the most beautifully realized. Buying a Princess: We offer used Princess Yachts for sale worldwide, including Princess Motor Yacht, Princess Flybridge, Princess Sport Cruiser models and more! Contact our sales professionals for immediate assistance. Selling Your Princess: With a team of experienced yacht brokers and marketing professionals, we will employ a comprehensive marketing approach to ensure your vessel receives maximum global exposure online as well as exposure in person at major boat shows. Learn more about how SYS Yacht Sales will help to sell your Princess yacht!